Lis (La Mia Cucina) and Ivonne (Cream Puffs in Venice) founded Daring Bakers, a group of approximately 1000 bakers that take the Internet by storm once each month when they reveal a daring recipe that they have all made. In this two part interview, we learn how Daring Bakers started and how it got to where it is today. More than anything else, it's a story of friendship and community. Ivonne: Basically, the Daring Bakers is a huge group of bakers that are connected virtually. The basic premise is that once a month we all present a challenge that we have baked. The challenge is hosted by one or two or three people - they choose whatever recipe they want and we have a private forum set up where the recipe is posted. You have the whole month to try it out and then on a given date everybody unveils the recipe to the world. In a nutshell, that’s what we do. It’s actually about a million times more complicated than that. From the organizational point of view it’s a lot of work - it’s a lot of fun, but it’s a lot of work. We’ve got about 1000 members now, so it’s a big job to keep everything organized and running smoothly. But it’s huge fun, and it’s hugely rewarding, so in the end it’s all worth it. How did Daring Bakers get started? Lis: Ivonne and I just wanted to bake the same recipe together because we’d never baked soft pretzels before. Once we posted, we had so many comments and emails from people that we really had just started to get to know from blogging, wanting to join in. It started off with three the first time, then two, and then probably for the first four or five months there weren’t really that many joiners and then, boom, we started to get slammed. It was fabulous and amazing and blew us away! Lis: My father used to make this Christmas sauce that we loved and none of us idiots paid attention. I went around looking around for Italian-based blogs and hers was the one that caught my eye. I just emailed her and said, “Hi, I love your blog and by the way, how did my dad make his sauce?” We just started talking from then on. Ivonne: When I went to her blog, it was like an instant thing. I was like “Oh yeah, I feel like I know this person!” It’s really funny that the connection was instant considering we’ve never met in person. It’s pretty amazing to think how closely we work together, but again it’s because that connection was there right away. Lis: I seriously consider her like a sister. We tell each other everything. Ivonne: Not to be corny or anything, but it’s so true. It’s like I’ve known her my whole life - like she’s a member of my family. She can’t get rid of me. Do you use phone, email, and IM? Lis: Sometimes all at once! How do you distribute the work between the two of you? Lis: I think we are equally as important. We both work our rears off. It’s pretty much split right down the line. Ivonne: I think the reason it works so well is that we both bring our own skill sets to the table. Lis (like I say all the time) is like the organizational queen. She can organize anything in no time flat and she’s on the ball. That’s not necessarily one of my strengths. It just works, we complement each other. Is there ever a problem with the recipe that the members select? Lis: We are probably excited every time. Every time it’s something that normally she and I might not bake ourselves. Ivonne: I think that’s been one of the keys to Daring Bakers' success. People have chosen things that you wouldn’t just wake up on a Sunday morning and be like, “Oh - I think I’ll make croissants from scratch.” Lis is right that for the most part, we are always excited to see what the challenge is. As we’ve existed longer, what we see more and more is that hosts might ask us for some advice, but people are free to choose whatever they want. The reveal day is always an exciting day for the Daring Bakers. Lis: And a busy day! What is involved with the reveal day? Lis: The day of the reveal is the day when so many people want to join. They all email us on that last day. We always cut it off on the day of the challenge. If you get your request in that day, you’ll be in for the next month, if you don’t get your request in until the following day, then you are in for the following month. Once they become a member, they are a member until they decide to leave. The only little thing is that we have to cut it off at some point or we won’t be able to keep this organized - so the day of the reveal is the last day to become a member for that month. Ivonne: We’ve had months where there are like 150 new members, so logistically if we don’t have a cutoff it would be insanity. What do you do about members who don’t bake the challenges? Lis: You have to bake eight challenges through the twelve month calendar year – the year starts and ends on the month you join. You get four months off. If you skip two in a row without giving us a heads up ("something is going on and we’ll be back in a few a months"), we have no choice but to assume you don’t want to be in it anymore. You decided it’s too much of a commitment or whatever. Then, we take you off of the blogroll and out of the private forums. Other than that, though, it’s just a big party! Do you make money from Daring Bakers or is it a labor of love? Lis: It’s a labor of love. We of course would love for this to become a business one day. We would love to be Martha! We are not going to lie. We want to be Martha! Of course, we see some opportunities to make some money and we are going to try. It costs money to keep this going. We are having a new website built so it’s going to be more for the public as well as our members. We want to make it so non-members don’t have to have the stress of joining, but if they’ve got baking questions, they can come ask and our members will answer them as best they can. Even people that write to us and say they couldn’t bake themselves out of a paper bag end up with beautiful stuff because you get so much support throughout the month. I really do think that the public would benefit from being able to play around with us a little bit more other than reading our things once a month. Are your forums very active? Lis: Yeah! But that’s just the tip of the iceberg. Most people just come and read, but with all of the activity going on, you would think that everybody is participating. We’ve got some great people that are just always there helping out and giving suggestions and tips. Our alternative bakers (people who can’t normally use regular wheat, flour, sugar, things like that) are fabulous! These people are amazing. Ivonne: We call those people our alternative Daring Bakers because they always have to come up with an alternative to the main recipe. They have to find ways to substitute whatever it is that they can. I think Lis made a very good point that as much work as we do, a huge part of the Daring Bakers' success is the help that we get from our Daring Bakers. It’s amazing how all of these people who don’t know each other will band together to to help each other out. It’s pretty incredible. Lis: They talk about everything you can think of. Ivonne: They’ll be talking about the specific recipe, other things, or cookbook suggestions. It’s really become a social forum - like the Facebook for cooks, if you will. Were you surprised that so many people joined? Lis: Oh God, yeah – we just thought it would be me and her. Ivonne: Just the other day, I emailed Lis and said, “When we baked those pretzels, did you ever think that in August, 2008, we’d be signing up our 1000th member?" In a lot of ways, it’s unbelievable, but in a lot of ways it isn’t. I don’t think people that aren’t in the food blog community realize what a force it is. I think with the Daring Bakers, it’s a combination of the novelty of trying something new and the idea of being in a community of people where all are doing the same thing and it’s all kind of like a secret. People enjoy it. Lis: Another good point is that we really do offer a fabulous service to so many people that they can't get anywhere other than possibly having to sign up for classes. They can get every single recipe, technique, or ingredient question answered virtually in minutes. What I like the best about all of it is the novice bakers. The emails they write us – they are shaking in their boots, they don’t think they are worthy, but in a month or two, they are baking stuff just like our professionals. I’m not going to say that it’s because of us (all the members) but we are definitely helping bakers that weren’t so sure of themselves to gain confidence in the kitchen. Is there an average member? Lis: No, we have really a wide variety of people. Ivonne: We have people from literally every corner of the earth. People that blog, professionals, and stay-at-home folks. Lis: We have men! Wonderful men bakers! Ivonne: Yes, Lis. There are men in our group. I guess maybe the one thing everyone has in common is that they like a challenge. I am enjoying this interview! It is fun to hear the Daring Bakers "behind the scenes". I am not a member myself but an avid spectator of the DBs. Yay Daring Bakers! I'm not a member, but I love reading all the postings. How cool that it started with Lis, Ivonne, and a pretzel recipe and is now so huge! Yay Daring Bakers! Ivonne and Lis are so great! And it's really interesting to learn all this new stuff about the DB's too! Thanks so much for interviewing Lis and Ivonne. 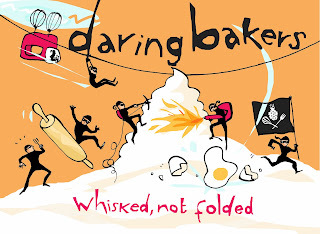 I've been very intrigued about Daring bakers but a little confused about how it operates. This interview has been very helpful. I'm looking forward to signing up! Great interview! I'm a new member to their group and can't wait to start my first challenge. Wonderful interview Ivonne and Lis! If you add the non DBs who regularly check out what the DBs are up to each month, it is probably at least 5 or 6 times the number of members. They, too learn by reading the posts about each month's challenge. Quite a blessing to anyone interested in baking, member or not. I'm anxiously awaiting August when I'll officially be a Daring Baker! I cannot wait!!!! :) Thanks for the fun interview! I'm a Daring Baker myself and love being part of this wonderful group! Just last month I baked something I never thought I could...Danish Braid. Puff pastry has always been a total mystery to me. But I made it and, if I may say so myself, it was pretty good. Imagine that! Three cheers for Ivonne and Lis! A great interview! Keep up with the wonderful work, Lis & Ivonne! I loved the Interview and I think it´s a great feedback from what they keep doing every month. Bringing people new challenges, joy and excitement!!! I´m really happy and proud to be a Daring Baker member!! Many thanks and Congrats to LIS and IVONNE and applause to the DB!!!!! Lovely interview!!! Way to go! !